Find a therapist in Louisiana with GoodTherapy.org. Estimates from the United States Census Bureau suggest Louisiana had a population of 4.67 million people in 2015. Approximately 24% of these residents are less than 18 years old, while 13% are 65 years or older. Female residents make up 51% of the overall population. According to the Bureau of Labor Statistics, roughly 24,360 people were working in social service and community care professions in 2015. Typical occupations included work as drug and alcohol rehab counselors, clinical social workers, psychiatrists, certain categories of religious workers, and therapists at depression treatment centers. In Louisiana, residents who worked in these fields took home a mean annual wage of $41,780. In the 2016 edition of the State of Mental Health in America survey—conducted annually by Mental Health America (MHA)—Louisiana was given an overall rank of 43rd for current mental health standards, meaning the state has high rates of mental health conditions and low rates of access to mental health care. MHA researchers say this low ranking correlates with adverse social conditions within the state, including high rates of violent crime, obesity, poverty, and unemployment, as well as low rates of high school graduation. 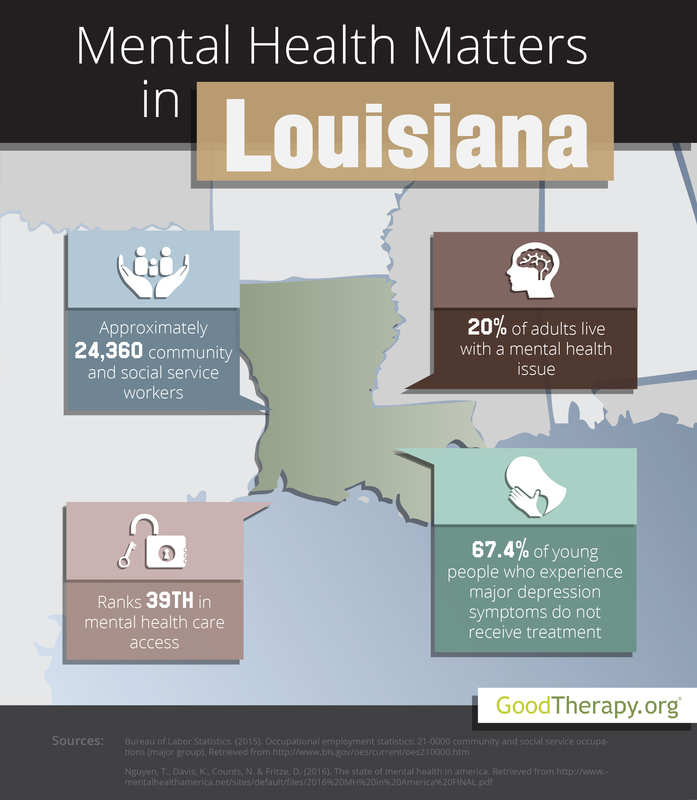 In major categories related to mental healch, Louisiana was 37th in adult ranking, 32nd in youth ranking, 32nd in prevalence of mental health issues, and 39th in access to mental health services—all placing in the lower half of the ranking list. In Louisiana, approximately 20% of adults have at least one mental health issue, 8.4% have dependence on alcohol or drugs, and 4.4% have serious thoughts of suicide. The state was ranked 43rd, 15th, and 43rd in these respective care measures by Mental Health America in 2016. Roughly 260,354 adults with a disability could not seek treatment due to cost, while 385,000 Louisiana residents with mental health issues did not receive treatment. At 17.7%, the state was ranked a mid-range 27th for adults with mental health issues who do not have insurance. Researchers and therapists in Louisiana also evaluated the state across several categories for young people. Louisiana ranked 15th for young people who had at least one episode of major depression in the past 12 months, and 26th for young people experiencing major depression with severe symptoms. The 2016 MHA report further explained that 67.4% of adolescents with episodes of major depression didn’t receive professional care, while 22.5% of adolescents with severe depression symptoms received consistent depression treatment. The state was 38th for young people who abuse alcohol or drugs.